Late last year the British High Court delivered a very interesting judgement on the assessment of delay, disruption and prolongation claims. A delay to an activity may disrupt the work and it may delay the completion of the project. The two factors are independent (this is the fundamental principle in the UK Delay and Disruption Protocol). In Costain Ltd v Charles Haswell & Partners Ltd  EWHC B25 (TCC) (24 September 2009), the High Court has determined that for prolongation to occur, the actual delay has to flow through to a delay in the completion of the works. The mere fact the delayed activity was on the then critical path when it occurred is not of itself evidence the delay flowed through to the completion of the works. At paragraph 200(ii) the Justice Richard Fernyhough QC stated I find that it has not been shown by Costain that the critical delay caused to the project by the late provision of piled foundations to the RGF and IW buildings necessarily pushed out the contract completion date by that period or at all. The fundamental issues relate to the definition of the critical path were canvassed inin my 2006 paper ‘Float is it real’. Despite the CPM requirement for a single duration estimate, durations are variable; changing the estimate of a planned (future) duration or differences between the actual duration and planned duration on completed activities may change the critical path. 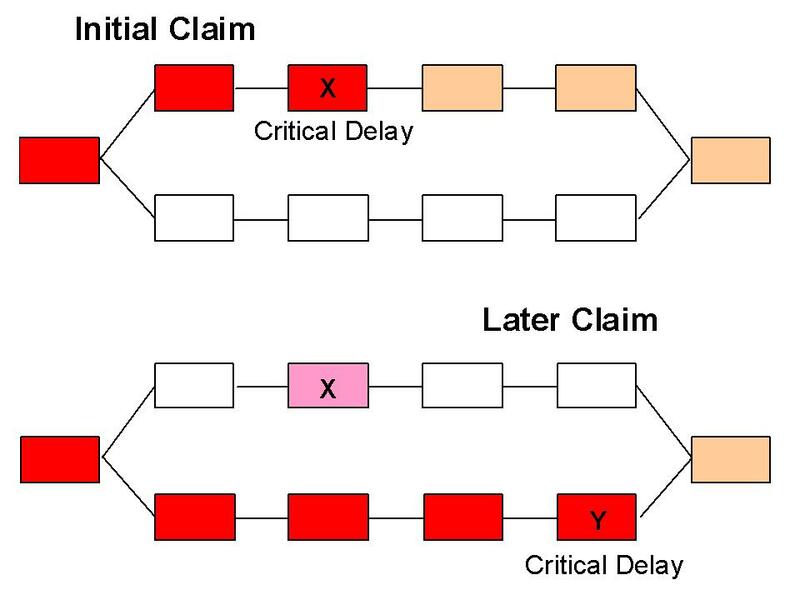 In the example above, at the ‘Initial Claim’ the critical path was running through the top chain of activities and ‘delay x’ was encountered. As no one can predict the future, at the time of the dealay it would be reasonable for everyone involved in the project to assume this is a critical delay and administer the contract accordingly. Later, changes in the duration of the activities cause the critical path to move (either reduction in the time needed to complete some activities in the top chain or increases in duration in the lower chain, or both). When ‘delay y’ occurs as a ‘Later Claim’, this is also a critical delay based on the schedule at the time of the delay. However, given the definition of the ‘Critical Path’ is: Generally, it is the longest path through the project. …that determines the duration of the project. The difficult question to answer is what happens to ‘delay x’, it appeared to be critical based on the best information available at the time the delay occurred. But changes over time (and after the time of the initial delay) have shown ‘delay x’ to actually be non-critical. Certainly based on the Constain’s case, scheduling experts will need to define far more than simply a delay to an activity on the current critical path. As a minimum it will be necessary to show the delay impacted the overall completion and the extent of the impact. It will also be necessary to show the delay caused a general increase in costs for a prolongation claim to be sustained. Two weeks ago I was elected President of the PMI Melbourne Chapter. The previous team have left the organisation in good shape, thanks are due to Ken Farnes and Doug Treasure, but as with any growing organisation there are always many new things to do and processes to improve. My other commitments to PMI continue, as a regular columnist in the PM Network magazine (next column due publication in March) and as a blogger in the PMI Voices on Project Management team. The major work of editing and finalising the content of my new book, Advising Upwards: A Framework for Understanding and Engaging Senior Management Stakeholders cuts in shortly. The eminent panel of writers who are contributing chapters are due to submit their first drafts in a few weeks. The next few days are occupied with the PMI Asia Pacific Congress, most of the time I will be around the Melbourne Chapter booth and have my paper, Beyond Reporting – The Communication Strategy to present. I still have lots of ideas for posts for these blogs and white papers for the Mosaic site but may be slower in delivering them this year. Just as well we are in the Year of the Tiger – I feel as though I will need all of the power and energy the Tiger possesses. Has Microsoft overcooked the price and performance of Microsoft Project (MSP)? With the impending release of Project 2010 most organisations should be re-evaluating their scheduling tools. Blindly following the Microsoft upgrade path should not be an option. The trigger for this post is a number of emails I have received plus comments in a number of published articles and on Planning Planet. Some users criticise MSP for flawed analytical performance, poor data handling and lack of real power in analysis. Other users criticise MSP for being too complex and too hard to use (you could almost feel sympathy for the MSP development teams dilemma). These criticisms have not changed much since the release of Project 2003 and Project Server. What has changed dramatically is the scheduling software market. Through to the early 2000s Microsoft virtually gave MSP away, almost anyone could access a ‘competitive upgrade’ for under US$100. The very low cost of MSP effectively destroyed 90%+ of the mid to low end competition, TimeLine, CA SuperProject and a host of other businesses closed merged or changed focus. Today most people outside of major corporations pay around US$1000 for a set of MSP. This tenfold increase in the ‘real price’ of the tool, primarily caused by the elimination of heavy discounts has opened the window for a host of new players in the mid to low end scheduling market place. Many with free options. Asta PowerProject seems to be a complete replacement for MSP with equivalent levels of capability and sophistication and better presentation and analytical capabilities. This is not a comprehensive list by any means more tools are documented on our ‘scheduling home page’. And I have not ventured into discussion of the high end products such as ACOS, Micro Planner, Primavera, Spider and the Deltek range. The purpose of this blog is to challenge every organisation to really evaluate their scheduling requirements and test the market before letting their IT department blindly follow the Microsoft upgrade path. Project 2010 may still be the best answer, but this needs to be an informed decision based on a proper review of the available alternatives. Simply paying the cost of upgrading to project 2010 (including licence fees, retraining and data conversion costs) without re-testing the market should be seen as being totally unacceptable because in 2010 there is a real choice of tools available! Knowledge alone is not enough! To be effective in any sphere of life you need to be capable of applying knowledge effectively to achieve an outcome; this is competency. However, to be really effective you not only need to be capable of being competent, you need to be willing to act, to use your capability effectively. Effective (ie, competent) managers need to know what should be done, have the skills to do the work and be willing to actually do the work. Putting this into context, project managers agree that having an effective schedule is important and also know they need knowledge of CPM theory (summarised in Chapter 3 of the PMI Practice Standard for Scheduling) and their scheduling software to produce a realistic and achievable schedule. But simply creating a schedule is not sufficient – the project manager needs to make effective use of the schedule if it is going to add value to the project delivery process. – behavioural competencies – how you operate in the workspace and interact with people. – attitude (how willing or effective you are in applying the skills). This is normative competence and is the structure of PMI’s Project Manager Competency Development Framework and virtually every other professional competency framework including those developed by the AIPM, IPMA and GAPPS. However, the framework dates back to the industrial age where task repetition was common and one could learn the best-in-class approaches and emulate these to deliver new tasks. In the ‘age of knowledge’ this is probably not sufficient, competent project managers in the 21st Century need to grow beyond normative thinking and embrace transformative practice. Project management competence is shifting from a process view towards autonomy; self reference and group self organisation. These qualities empower professional project managers to perform well despite prevalence of complexity and rapid change. They develop customised solutions for each new, unique, occasion; implementing the new solution requires the use of existing knowledge but will also generate new knowledge. This constructivism theory has a basic assumption that each time you perform a new activity you build on your existing knowledge to acquire new insight and competence, and consequently engage in continuous learning. To be really effective, the organic ‘on-the-job’ learning should also be reinforced with the acquisition new information from journals, innovative courses, discussions with colleagues and participating in communities of practice. Consolidating the new learning into tangible and useful knowledge needs reflection (to understand what has been learned) and possibly the assistance of a mentor to help unlock the complex factors needed to grow within yourself, develop creative solutions, and find new ways to succeed. Yesterday’s competence is the foundation on which you can build tomorrows, but relying solely on yesterday’s skills is insufficient! Competent project managers know they need to keep learning and developing. 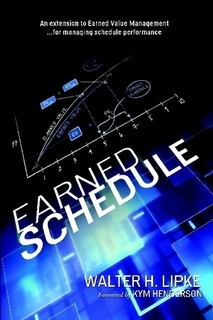 In the March 2003 edition of the PMI College of Performance Management journal, The Measurable News Walt Lipke published his seminal paper “Schedule Is Different” and introduced the world to Earned Schedule (ES). The challenge of predicting the likely completion date for a project is fraught with issues. There are no established protocols for scaling the remaining durations in a CPM schedule to take account of actual performance to date and there is no way of dealing with the consequences of a ‘bow wave’ of non-critical tasks consuming float until after they hit the critical path. Re-scheduling the project is the same as re-estimating the work, a practice long discredited by Earned Value (EV) professional as being less accurate and more expensive than using EV formula to calculate a predicted cost outcome. And, the SPI and SV calculations cease to have any validity as the original project completion date is approached. In short, SPI does not work and CPM is wildly optimistic. Walt solved this problem at least in part with the invention of ES. ES uses standard EV data to calculate a set of schedule indicators, which behave correctly over the entire period of project performance. The methodology and spreadsheets needed for calculation are freely available from the ES website. Now Walt has published a sensibly priced book that explains the concept of ES and additional advances to the theory and practice of ES including the “P” factor, a measure of schedule adherence and “Effective EV,” which discounts the EV accrued by EV earned out of the correct process sequence. I downloaded a PDF version of Walt’s book from Lulu Publishing for under $15; printed paperback books are available from Amazon, Lulu and a range of other book sellers. Used properly, ES is the bridge between EVM cost and network schedule analysis, improving and providing the base for further developments in cost-schedule integration. ES can’t replace scheduling (and does not seek to) but it does provide a useful insight above and beyond what’s achievable using either traditional EV calculations or traditional CPM scheduling. This is a book serious project control professionals cannot afford to ignore! A wombat walks into a café. He orders a sandwich, eats it, then draws a gun and fires it into the ceiling. ‘Why?’ asks the confused waiter, as the wombat makes towards the exit. The waiter turns to the relevant entry in the manual and, sure enough, finds an explanation. (The Australian version of this joke is actually eats roots and leaves – wombats live in burrows – but I won’t go there). In face to face conversations, recognising misunderstandings that can lead to a breakdown in communication is fairly easy; up to 90% of the communication is through body language and vocal tones. Even with telephone calls, the tone of voice tells you a lot about the other person feelings. Traditional writing with proper sentence construction and punctuation falls a long way short of verbal communication but is also a well understood structure for conveying information, if not understanding. However, the arrival of emails, SMS and twitter has transformed the communication landscape. In a virtual team probably more than 90% of the communication is based on the words in emails and texts. These communication media do not follow the traditional rules. People in a well established group operating virtually may be able develop language protocols that provide effective communication but to outsiders this ‘new language’ can be almost impenetrable. Cn u undRst& dis? (translated at Lingo2word = can you understand this?). Throw in some good old industry jargon and from the perspective of the old rules, it’s surprising any one actually communicates. But they do, or at least appear to! One study has suggested good virtual teams outperform good co-located teams but poorly functioning virtual teams are far worse than poorly function co-located teams. I need to follow up on this but my first impressions are the breakdown in communication implied in the study has far more impact in the virtual arena. In this new age of interconnectiveness the rules of effective communication are different and rapidly evolving and the degree of acceptance of these ‘new rules’ is likely to be in part age based. Most people in their 50s and 60s really need to see someone they are dealing with at least once or twice to build rapport and open effective communications; whereas younger people seem totally comfortable building rapport by email and text. Another aspect is the global nature of ‘web2’. Old communication protocols varied from society to society based on each society’s concepts of formality, social structure and power. Outsiders who needed to communicate effectively in a different culture learned the appropriate cultural norms. How relevant these traditional forms are to people under 30 who can communicate with anyone, anywhere using SMS and email, not to mention the social networking sites such as twitter has not been determined. More things to look at…..
What does this mean for a manager developing a communication plan today? The short answer is I don’t know. Effective communication is still critically important in most aspects of business but I would suggest relying on any set of protocols that worked in the past without a careful assessment of their current effectiveness is likely to be counterproductive. Some of these questions will be addressed in my new book, Advising Upwards: A Framework for Understanding and Engaging Senior Management Stakeholders (publication 2011), many of the others are starting to be worked into our communication workshops but there’s a long way to go both academically and practically to really come to grips with the new communication landscape. Apparently weather forecasters don’t need satellites and schedulers are redundant (or should that be rodent…?). Based on the following announcement “Catch all of the show at Gobblers Knob on Groundhog Day this year as Punxsutawney Phil and the Inner Circle of the Punxsutawney Groundhog Club predict the end to winter weather” (see: http://www.groundhog.org/) and the resulting answer of 6 weeks all we need is a well trained rat or two (maybe a Capybara for really big problems).